May is Stroke Awareness Month! Welcome back, everyone! You know what time it is. Time for another awareness blog post! I hope everyone’s had a nice week since our last post. I, for one, had a pretty uneventful week, which is exactly what I wanted so that I could catch up on some chores. Boring, I know, but it’s gotta get done, and I feel so much better now. So, that means I get to write this week’s blog without the laundry staring me down! It’s the little things in life that make you happy. Anyway… this has nothing to do with anything, and there’s no way you care about any of this, so, I’ll get to it already. Today’s topic is Stroke. 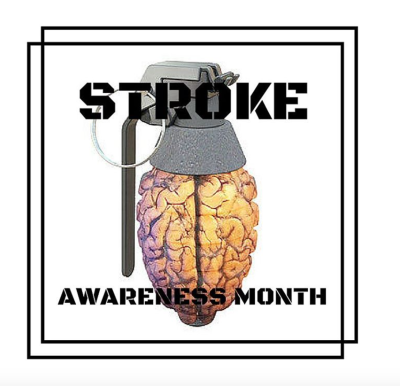 I’ve chosen to write about stroke, again, in honor of Stroke Awareness Month, which is observed every May in the United States. I’m going to use this week’s post to relay some important statistics about stroke to you. If you’re interested in reading all the basics, scroll down to our original stroke post. • Did you know that one out of every 20 deaths in the U.S. is caused by a stroke? That’s a pretty high number considering all the gazillions of things that can kill you. That means that annually, more than 130,000 people die from a stroke. • The above statistic leads me to this next one, which is… Stroke is the fifth leading cause of death in the United States. • Almost 800,000 people suffer a stroke. Of the nearly 800,00 people who have strokes, over 600,000 of them are first time strokes. With strokes, once you have one, your chances of having another are higher. This makes taking care of yourself and addressing your risk factors extremely important. The goal is to avoid having any other strokes. The second or third strokes become much more dangerous, and carry a higher potential of death. • Related to the statistic above, the remaining number of people who suffer a stroke are people who have already had at least one other stroke previously. That means around one in four stroke victims have already had a stroke. • Many people do not die from their first stroke. Every 40 seconds that pass, somebody suffers a stroke; But, every four minutes that passes, someone dies from a stroke. This means that there are a fairly large number of people out there who are living with the consequences of a stroke. This leads me to my next statistic. • Stroke is the leading cause of disability (long-term or permanent disability, not short-term disability) in the United States. These patients can no longer work, or will miss a significant amount of work while recovering. • Over half of stroke victims over the age of 65 lose some portion of their mobility, making them dependent on wheelchairs, walkers, canes, or caretakers. • Guess how much the United States spends on the associated costs of stroke every year. Here’s a hint; it’s a lot! Somewhere in the ballpark of a whopping $33 billion (yes, billion with a “b”) is spent annually on things like healthcare services, missed work or unemployment, and medications needed to treat the stroke, and more. • The vast majority of the type of stroke that people have is called are called ischemic strokes. Ischemic strokes are when the blood flow to the brain becomes blocked and prevents blood from circulating to the brain, which can cause serious damage to the tissue of the brain. The exact estimate (I know that sounds like an oxymoron, but an exact-exact number is difficult to find) of ischemic strokes that occur out of the total of strokes is 87%. That is an extremely high number, which means that risk factors that lead to this type of stroke may be common. If nearly 87% of strokes are ischemic, doesn’t it make sense that we should all evaluate our risk factors that could one day lead to us having a stroke? I think so! The problem is that people often don’t deal with things until they become a problem. The dangers of doing this with things that could lead to a stroke are that you may never be able to fully get back what you lose to a stroke. People lose their ability to walk, talk, feed themselves, bathe themselves, or care for themselves at all. What I’m trying to get at is: if you wait for it to become a problem, it’s already too late. So, I cannot stress the importance of annual physicals enough. Knowing your risk factors, and seeing when it’s time to make changes to your life are the most important things in order to prevent a stroke from happening (aside from actually implementing those lifestyle changes). • Strokes can occur at any age! Children can and do have strokes, however, your risk for having a stroke generally increases as you get older. In any given year, the percentage of people that suffer a stroke who are over the age of 65 is around 60%. • High blood pressure, high cholesterol, and smoking are common causes of stroke, and the scary part is that two thirds of the U.S. population has at least one of these conditions or habits. • Ethnicity does affect your risk for stroke. o Stroke risk for African Americans is twice as high as Caucasians, and they are more likely to die from it. o Hispanic people’s risk for stroke lies between the risk of Caucasians and African Americans. o The groups with the highest risk for stroke are African American, Native American, and Native Alaskan. • Less than 40% of people who have already experienced a stroke knew all the major symptoms to look for. • People who were treated in the emergency room within 3 hours of their first symptoms of the stroke have the best outcome, and experience less disability three months after than those who do not get to the emergency room immediately. Keep in mind that strokes can cause significant impairment so experiencing disability three months out is normal. Some people never fully recover. Some will spend years in rehab. When treated early, the outcome for stroke patients often improves greatly, as opposed to those who wait to seek medical attention. That’s a lot to take in, I know, but I just want to go over one last thing before I finish. The trick to remembering and spotting the symptoms of a stroke is the acronym FAST. F – stands for face. Ask the person to smile. Is their face symmetrical or does it droop on one side? A – stands for arms. Ask the person to raise both arms. Does one arm drift downwards? S – stands for speech. Ask the person to repeat a simple sentence. Do they slur when they speak, or repeat the sentence in a strange way, perhaps with different words? T – stands for time. If any of these symptoms, or a combination them, occurs, call 911 immediately! Getting to the emergency room as fast as possible is critical in minimizing damage. Do not wait to see if symptoms improve. Also, just a little tip, being taken by ambulance can be better than driving the person to the ER. This applies to all emergent situations. You bypass the waiting room when you’re brought by ambulance. The ER will still try to get you in as fast as possible if you report chest pains, or show signs of a stroke. The best way to make sure you are seen ASAP is to be taken by ambulance. Just something to consider if you suspect something potentially life threatening may be happening. That’s all for now! Thanks so much for reading, and I sincerely hope you never have to use any of this information. If you’re a new reader, give this short description of who we are and why we’ve started our awareness blog a quick skim. Personalized Cause runs this awareness blog. Personalized Cause is an awareness accessory company based in the United States. We specialize in custom awareness ribbons, which are a product unique to our company. Personalized Cause is the only company in the country to offer our customers the ability to personalize any color awareness ribbon they choose, with a name, date, phrase or message. Our custom awareness ribbons are a beautiful way to show support, raise awareness, or be an advocate for your cause. The thing that makes our custom awareness ribbons so popular is the fact that you do not have to buy in bulk. In fact, we have no order minimum for a custom awareness ribbon. We also carry classic awareness ribbons, fabric awareness ribbons, and silicone wristbands. So, if you’re interested, give our products a look. Our entire line of products is very affordable. Custom awareness ribbons are less than 10 bucks. Pretty cool, huh?! Personalized Cause started this awareness blog in order to help raise awareness for all different sorts of causes out there, using our website as a platform. We are all about awareness, and helping others to raise awareness for the causes that matter to them. We also wanted to take it upon ourselves to raise awareness on behalf of causes that are observed every month in the U.S., or internationally. So, we started this blog to hopefully educate our readers on the various issues affecting so many. You may not be affected by every topic, but you will probably encounter someone who is. We want to make our reader’s knowledgeable, sympathetic, understanding and accepting members of society. Guess what time it is, ya’ll? That’s right, it’s time for another edition of the awareness blog! I know you’ve all been waiting anxiously and refreshing the feed every hour, on the hour, since the last one. Nothing more exciting than learning about illnesses and diseases, I know. Today’s blog will discuss Strokes, because guess what… there’s a lot you need to know about them in order to prevent them or recognize them. But first, I gotta give you my schpiel at the beginning of each blog (feel free to skip to the good part if you already know our deal) until people get the hang of our blog and our business. Personalized Cause is an awareness ribbon company that specializes in custom awareness ribbons. We are the #1 source for personalized awareness pins in the United States, for personal orders (rather than bulk orders). We carry an assortment of other awareness ribbons and awareness wristbands. We decided to start this blog in order to raise awareness for all of the causes out there. Obviously, we know we probably won’t get to all of them, as there are more causes in the world than we could possibly cover. We hope to cover as many of the big ones as possible, though, in order to raise awareness, educate the public, and help to prevent any disease, illness, or event that we can. Our goal is to make all of our readers into advocates, and socially aware people, who just might pass that knowledge onto someone who needs it. We’re trying to do a pay it forward thing with medical and social knowledge. We’d like to save the world, but we know that task is more than we can achieve, so we’re doing the next best thing within our scope. We are empowering you all to go forth with what you learn here and make a difference where you can with the information we give you. Stroke is a terrible, awful, no good disease. If you’re thinking, a stroke isn’t a disease, you’re not alone there. Most people think of it as an event, like a heart attack, more than a disease. It is in fact classified as a disease, though. So what exactly is a stroke? We’ve all heard of them, but we may not know exactly what they are, aside from the fact that they are bad. A stroke affects the brain. They occur when blood vessels or arteries in the brain become blocked or clogged by a clot, or when the blood vessel ruptures as a result. When a blood vessel (or artery, from now on when I refer to blood vessel, that includes arteries) becomes clogged or blocked by blood clot, pressure builds behind the clog. The body continues to pump the blood, causing the pressure behind it to build and build. That pressure eventually becomes strong enough to force through the wall of the blood vessel. Whether the clot causes a rupture of the blood vessel, or is simply blocking off the blood flow, it causes the brain to stop receiving oxygen and nutrients through that pathway. When the brain is deprived of oxygen and nutrients, the brain cells begin to die. As a result, brain damage occurs, and permanent damage can be done. This is the reason that Stroke is the #5 cause of death in the United States, and one of the top causes of disability. Every 40 seconds that pass, somebody has a stroke, and every four minutes someone dies of a stroke. If you think it can’t happen to you, think again, because they can happen to anyone, and at any age, and that includes during childhood. But, here comes an important point… as much as 80 percent of strokes can be prevented, and the severity of the damage that is caused by a stroke can be dramatically reduced if the warning signs are recognized and the person gets treatment immediately. 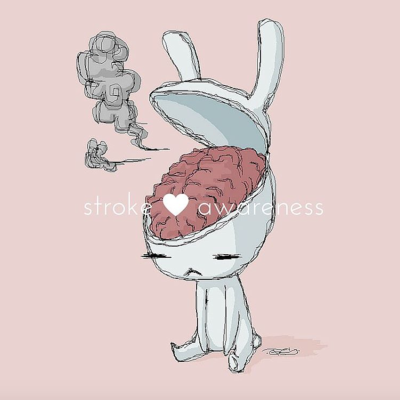 Not all strokes are the same. There are hemorrhagic strokes and ischemic strokes. Lets take a closer look at each of them, shall we. First up, hemorrhagic strokes are when a blood clot (also known as an aneurysm) bursts, or causes a leak. Think of a pipe. If a blockage occurs in a pipe, one of two things will happen. Either the pipe will completely burst, or the pipe will slowly leak. In both scenarios, you’re looking at a serious problem that requires professional attention immediately, in order to minimize the amount of damage done. The buildup of pressure from the excess blood in the brain (from the burst or leak) results in swelling and pressure in the brain. When swelling or pressure build up in the brain, it damages the cells and brain tissue. Only about 15% of strokes that occur are hemorrhagic, however, they account for around 40 percent of deaths caused by a stroke. They’re less common, but they’re more dangerous. Now, there are two kinds of hemorrhagic stroke, and they are called intracerebral and subarachnoid. The first and most common kind of hemorrhagic stroke is intracerebral hemorrhage. This kind of stroke is most commonly caused by high blood pressure and weakened blood vessels due to age, but it can also occur due to a genetic condition that causes an abnormal connection between arteries and veins in the brain or spine. This condition is called AVM, or arteriovenous malformation, and can be treated. Intracerebral hemorrhage is when the blood leaks or pools in the brain, causing cell death and the affected area of the brain stops working. The second kind of hemorrhagic stroke is the subarachnoid stroke. This occurs in the area between the actual brain itself, and the tissue that covers the brain. It is most commonly caused by an aneurysm that bursts. Next up, the ischemic stroke. Ischemic stroke occurs when the affected blood vessel is blocked. The blood clot that creates the blockage prevents blood from travelling to where it needs to go in the brain. When the blood is prevented from reaching parts of the brain, the cells die. Ischemic strokes account for the vast majority of all strokes. Again, blood pressure is the biggest cause of this type of stroke. These types of stroke can happen in two ways, called embolic and thrombotic. An embolic stroke is when either a blood clot or plaque build up forms in the body somewhere else, but usually in the heart, and then makes it’s way through the blood vessels into the brain. Because the blood vessels go from large (in the heart) and get smaller and smaller as they move into the brain, the clot or plaque buildup eventually reaches a point where it gets stuck and cant move any further, and causes an ischemic stroke. A thrombotic stroke occurs when the blood clot develops inside one of the arteries leading to the brain. Thrombotic strokes are usually caused by high cholesterol or atherosclerosis. Okay, now that you understand exactly how they work and the differences in kinds of stroke, lets look at the warning signs and symptoms of a stroke. Remember, especially parents, a blood clot can be formed from a run of the mill injury, so it’s important to be able to recognize the signs in children, too. There is a trick to being able to remember what symptoms to look for to identify a stroke. It’s called “act FAST.” A lot of people panic in emergency situations and don’t remember what they’ve learned, so this trick helps people remember what to check for. If you identify these symptoms, call 911 immediately! Do not pass go, do not collect $200, just get an ambulance there as fast as possible. The faster medical attention is received, the better the outcome will be. F- F stands for face. Is the person experiencing facial drooping? Ask them to smile to assess. A- A stands for arms. Have the person raise both arms out in front of them. Are they able to keep both arms level? S- S stands for speech. Ask the person to repeat a sentence or phrase to you. Do they sound strange or are they slurring? T- T stands for time, as in there is none to waste. So, if the person is exhibiting any of the symptoms above… call 911, as fast as humanly possible. It is also important to write down what time the first symptom or signs appeared. Think back on the day, did the person experience any unusual muscle weakness, or perhaps fall? Try to remember if anything unusual happened, even if it didn’t seem like a big deal. Write it on your arm, text it to yourself, repeat it to yourself over and over like a mantra until the paramedics arrive. The timing can determine some treatment options and decisions. That’s all she wrote. (I hope at least one of you laughed at that total dad joke.) Thank you for reading and I sincerely hope none of you ever need to use the information we discussed today. Better safe than sorry, though, am I right?! There are two versions of awareness pins for stroke. Red awareness ribbons are used to raise awareness for stroke, but there is a special pin designed to raise awareness for childhood stroke (or pediatric stroke.) Purple and blue awareness ribbons are used to raise awareness for pediatric stroke.